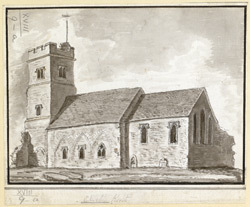 Drawing of St Mary's Church in Chalk in Kent. The west tower of this church acts as a landmark on the A2 London to Dover road. This church was built in the early Norman period with pieces added on later, including the west tower and aisles. In this view the arched brickwork on the nave's south wall shows there was once an arcade here - part of a south aisle which was erected in the 13th century and demolished in 1759.